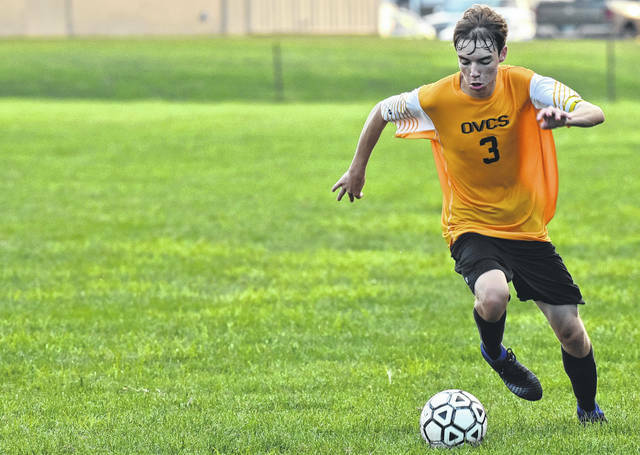 OVCS senior Trevor Blank (3) controls the ball during the Defenders 4-1 setback against Belpre on Thursday night in Gallipolis, Ohio. GALLIPOLIS, Ohio — One half of play can make all the difference. 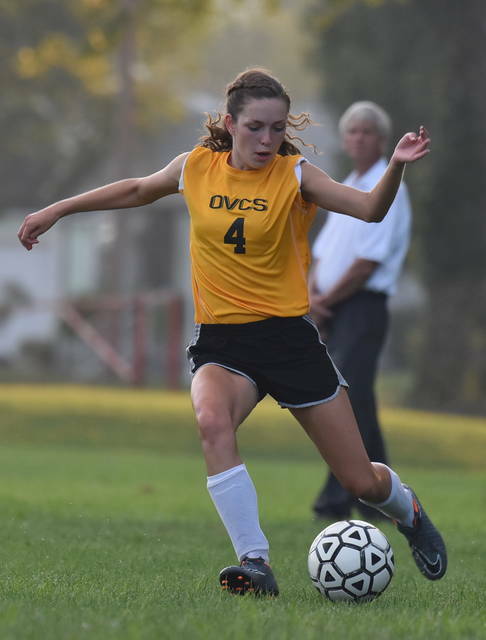 The Ohio Valley Christian School varsity soccer team fell to 0-2 on the season following a 4-1 setback to visiting Belpre on Thursday night in a non-conference matchup in Gallia County. The visiting Golden Eagles (3-2) scored three goals in the first half en route to the win. Belpre’s Wyatt Fields netted the initial goal of the contest, propelling the visitors to a 1-0 lead at the 25:58 mark of the first half. Asaphe Santana added two additional goals for BHS before intermission, the first coming at the 24:04 mark of the first half with his second tally of the half followed just 1:31 later. Santana tacked on a third goal at the 32:00 mark of the second half completing the hat trick as Belpre extended the deficit to 4-0. OVCS narrowed the margin to 4-1 with 28:36 remaining in the contest, as Trevor Blank’s shot from inside the box beat BHS goalkeeper Clem Brady. Both teams were held scoreless over the remainder as the contest, as Belpre earned three-goal victory. OVCS goalkeeper Conner Walter finished with seven saves in the contest, while Belpre’s Brady saved six. The Golden Eagles outshot the Defenders by a sizable 30-7 overall margin and also claimed a 9-0 edge in corner kicks. OVCS returns to action on Tuesday, as it travels to face Wood County Christian.